← Don’t Add or Take Away! Come can be a very friendly verb. “Come in!” welcomes a person who is not sure of how he will be received. “Come with me, we’ll take care of that,” assures someone that a friend is helping her. 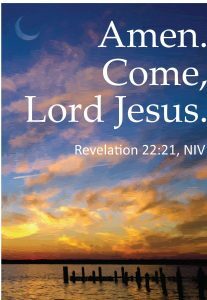 Come is a crucial concept in Revelation 22:16–21, as we come to the end of our study of this book of Scripture. The conclusion invites, even urges you to come to Jesus. And it calls you to join in a prayer for him to come. Come to Jesus. Come to the water of life! Revelation 22:17 extends an invitation to anyone who need forgiveness to come. The invitation draws on the one extended in Isaiah 55. Notice the repeated invitation, even command, to come. Buying without money seems contradictory, but the focus in on the rich grace of God. It is totally undeserved, unearned. And it echos and extends the cry of Jesus in John 7:37–39. Water of life here in Revelation is not a substance, but a person. The invitation is to come to Jesus himself, the Savior, the one who, by being slain and rising again in the place of his people, has purchased their redemption. He has not only reconciled us to God, more importantly, he has reconciled God to us. If you have not yet come to Christ, respond to this invitation. Entrust yourself to him. And if you are in Christ, keep on coming. We do that as we keep coming to him in the Lord’s Supper. Coming to Jesus involves more than just praying a sinner’s prayer. It requires a life of commitment to him. Salvation is based totally on his work in your place, but it also calls you to keep every word that comes from God’s mouth. The warning about not adding to or subtracting from the word of prophecy is place in this context. “[Revelation] is not a book of riddles but a proclamation of the Great King. The end echoes the beginning. The Great King binds us to His covenantal Word. We live by faith alone, by grace alone, by Scripture alone.” (C. Vanderwaal, Search the Scriptures, Vol. 10, p. 111). As the bride, join in extending the invitation. When you come to Jesus you become part of his bride, the church. It is the Spirit and the bride that issue the invitation. This is essential to the work of the church this side of glory. It is not the most essential part of the work of the church. You have gathered to worship your God, to renew your covenant with him. The task of worshiping and praising God will continue for all eternity, just as it is going on in heaven right now. But, as long as God, in his patience, delays the judgment, as long as there are still sinners to call to repentance, you, the church-bride, join the Spirit in issuing this gracious, urgent invitation. While the church can and should do many good things, at the heart of its work this side of glory is making know the good news of Jesus Christ. You join in that as the church preaches the gospel, as you send home and foreign missionaries, as you pray for them, as you support the work of training. You join in that as you quietly talk to a neighbor or friend, as you live a life that motivates people to as the reason for your being different from them. We live in a dark, troubled world. Notice how John describes both the Spirit and the church as lamps, the Spirit in heaven, the church, through whom he is working, here on earth. “[I]t is appropriate that the Spirit, symbolized as lamps in heaven (Rev. 4:5), and the church-bride, symbolized as lamps on earth (1:20), now blend their voices to invite this world’s thirsty ones to the water, holding forth the testimony of Jesus for as long as God’s patience delays final judgment.” (Dennis E. Johnson, Triumph of the Lamb, p. 329). You cannot respond by coming to Jesus, without then also praying for him to come. Come, Lord Jesus. The Son of David assures you that he is coming soon. He is identified as the offspring of David, Revelation 5:5, at the heart of his identity as the Lamb that was slain and is alive. That looks back to Isaiah 11:1, 10. Here, “Offspring” is added. Jesus is the great, messianic king, fulfilling all the prophecies of the Old Testament. He is the light-giving Morning Star (Revelation 2:28—part of the promise to those in Thyatira who overcome), see Isaiah 60:1–3. The testimony of who he is has been given to you—note that the you in Revelation 22:16 is plural. It is not just to you as an isolated individual, but to you as a church that Jesus speaks his words of assurance. Say “Amen” to Christ’s coming. Jesus assures you that he is coming. And to that, John adds Amen, indicating certainty. 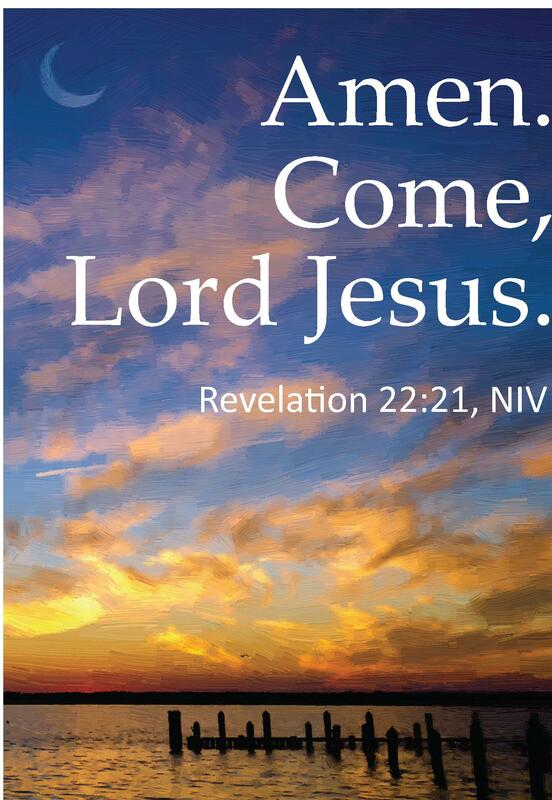 He invites you to join in his prayer for Jesus to come, Revelation 22:21. As you wrestle with sin in your life and see its corrosive effects on those around you—both in the world outside, and even within the church, join in that prayer. As you see pain, sickness, loss, suffering, and death, pray, “Come, Lord Jesus.” But when you pray this prayer as it is found here at the end of the Book of Revelation, it is not a prayer for escape. Rather, it is a prayer for Christ to complete the work that he has been doing throughout his whole work as the Messiah. It is a prayer for him to complete the work he has been doing as the eternal Word. Pray for his kingdom to conquer, for him to bring in the fullness of his kingdom, for him to subdue you totally to himself. The return of Jesus is the inevitable outcome of who he is and what he does. He is the fulfillment of the Father’s plan. He is bringing all things together. “Because Christ is the savior of the world, he will someday return as its judge…. Because the creation is his work, it cannot and may not remain the booty of Satan. The Son is the head, Lord, and heir of all things. United in the Son, gathered under him as their head, all creatures return to the Father, the fountain of all good. The second coming is therefore required by his first coming.” (Herman Bavinck, Reformed Dogmatics,Vol. 4, p. 685). Because of who Jesus is and what he has done, John can conclude this book that is full of strange symbols and dramatic events, the way that most New Testament letters end: “The grace of the Lord Jesus be with God’s people.